It seems like the word of the month is “STORAGE”…or I guess it could be “organization.” For the sake of what I’m about to write, let’s assume the word of the month is storage, okay? 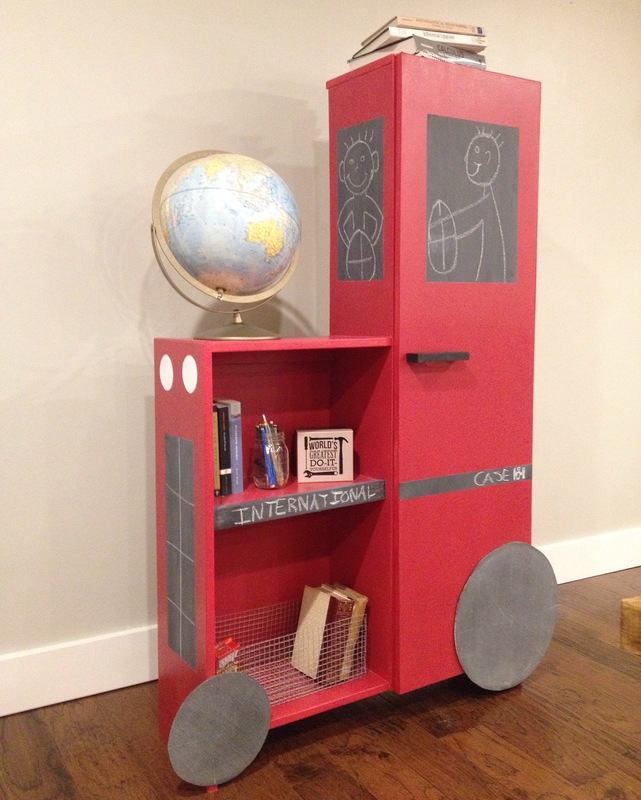 Now, storage comes in all shapes and sizes. 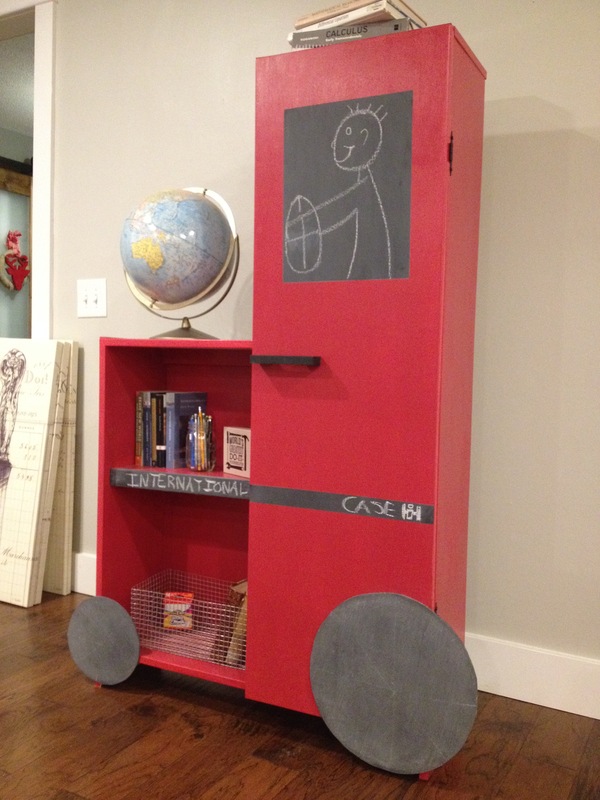 A shelf/cabinet shaped like a tractor is usually not what you typically see used as storage. It’s a simple build that is easily customizable, so I wont go into super detail since you could modify the measurements easily. 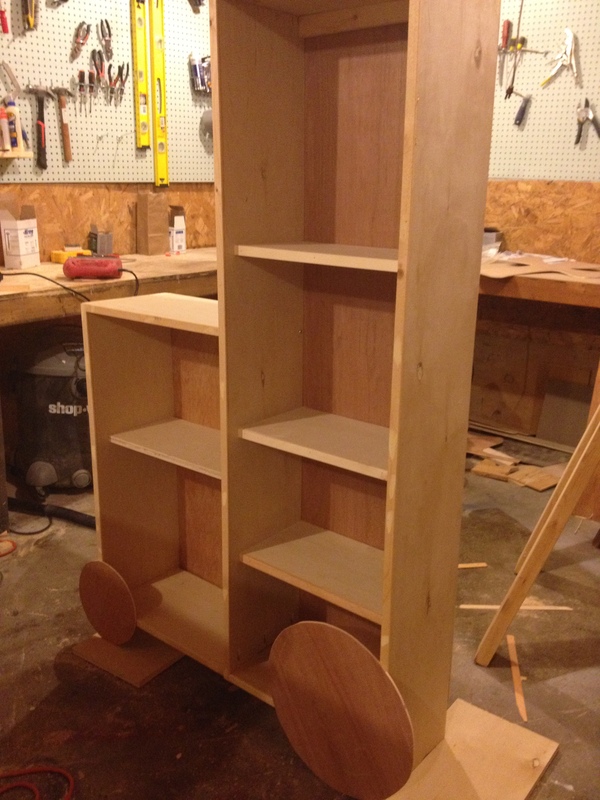 I built the sides and bottom first. You could make the shelf as deep as you wanted. 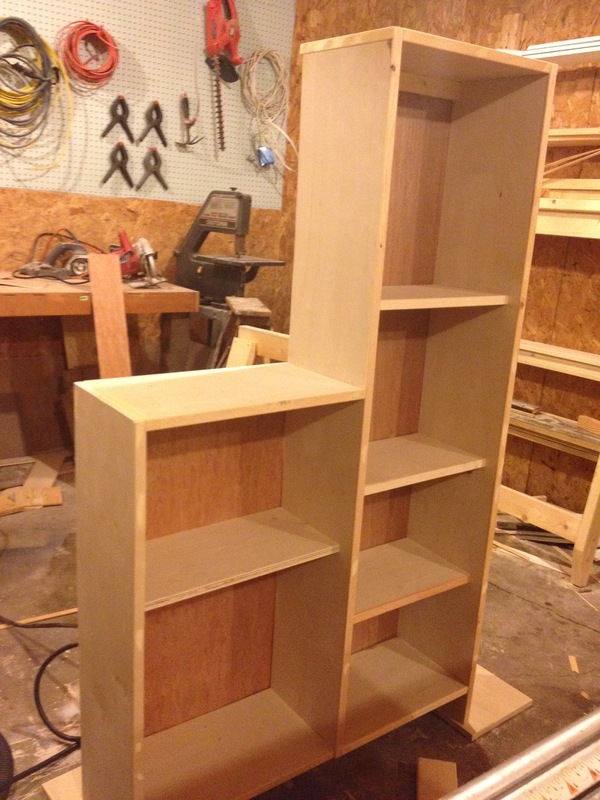 I did 10″ on the “frame” (but I made the individual shelves on the inside more like 9″). I made it 5 foot tall on the right, and 3 foot tall on the left, and 3 foot wide. 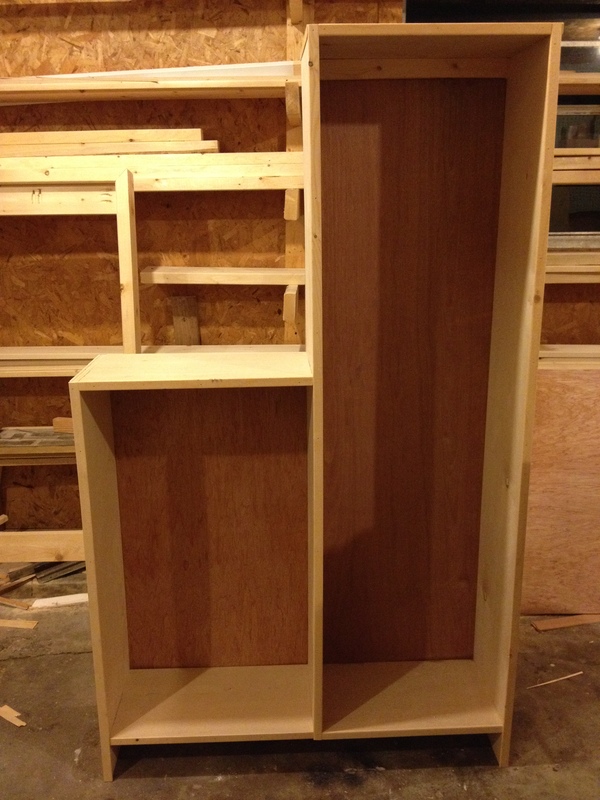 I screwed the pieces together with pocket holes on the bottom and had the bottom piece 3 1/2″ from the ground. Again, easily customizable. Then cut and attach the middle piece so that it is even with the top of the right side. Then I cut and attached the tops for the two sections. 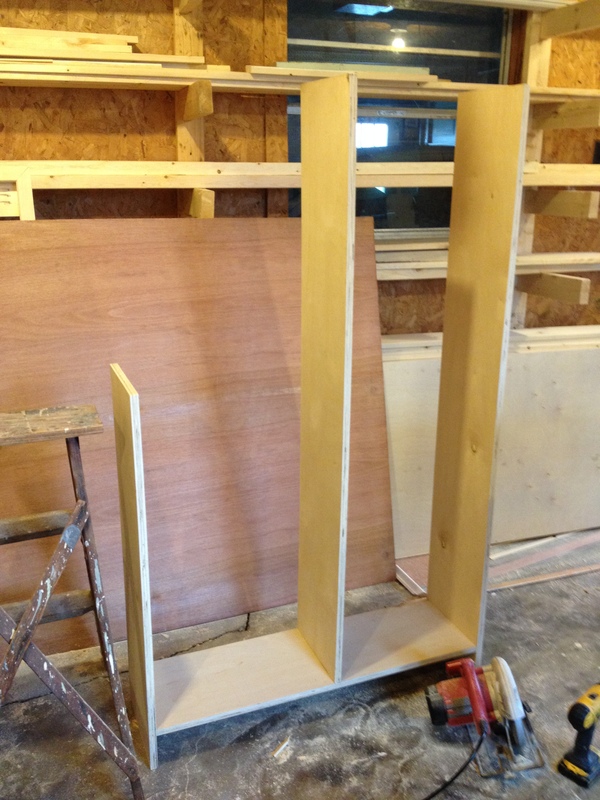 I glued and nailed thin strips of 3/4″ wood to the front of the plywood instead of doing face frames. You could use 1x2s and make face frames, or use edge banding. I had plenty of thin strips, so I used that. 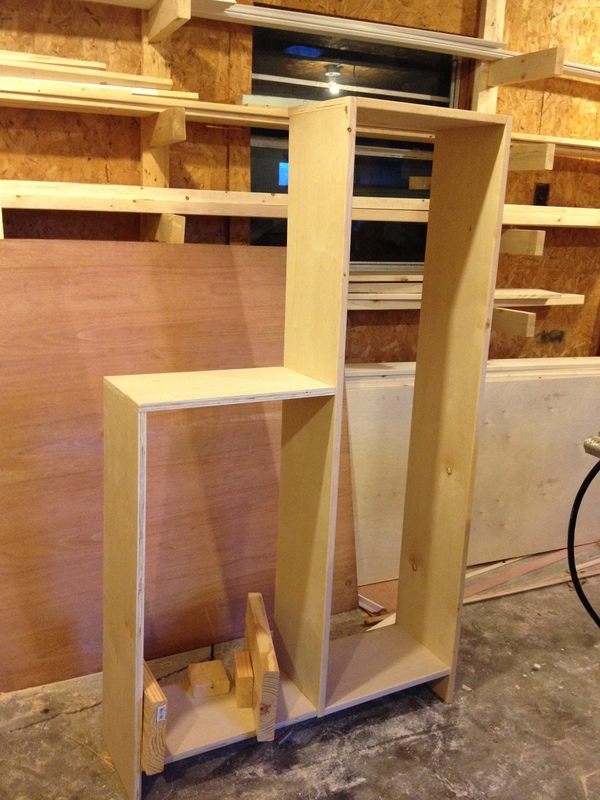 Once you’ve got the basic frame together, add the backing. 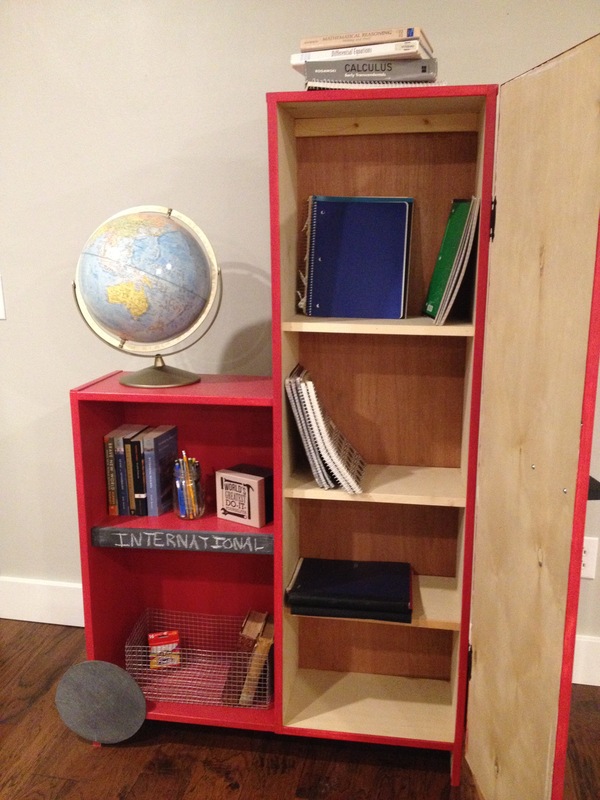 I used 1/4″ plywood and nails to attach it. 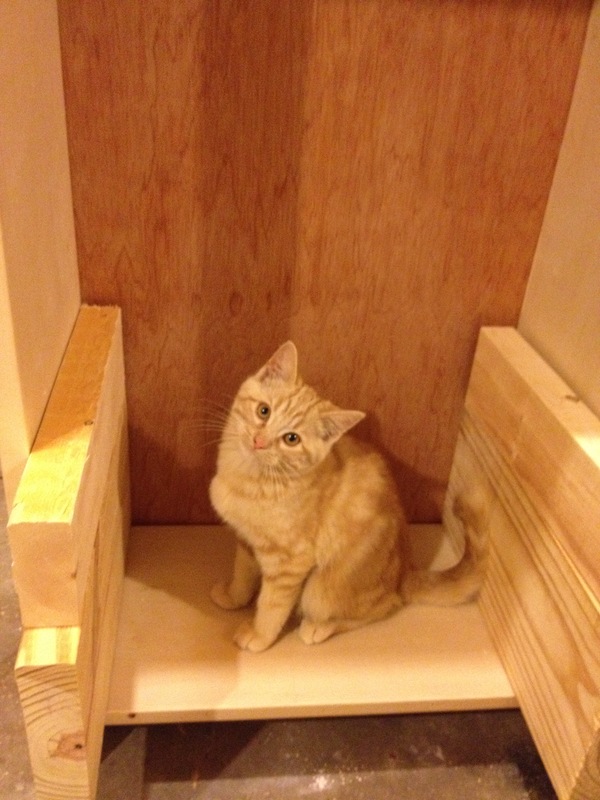 Then, measure and cut the shelves. 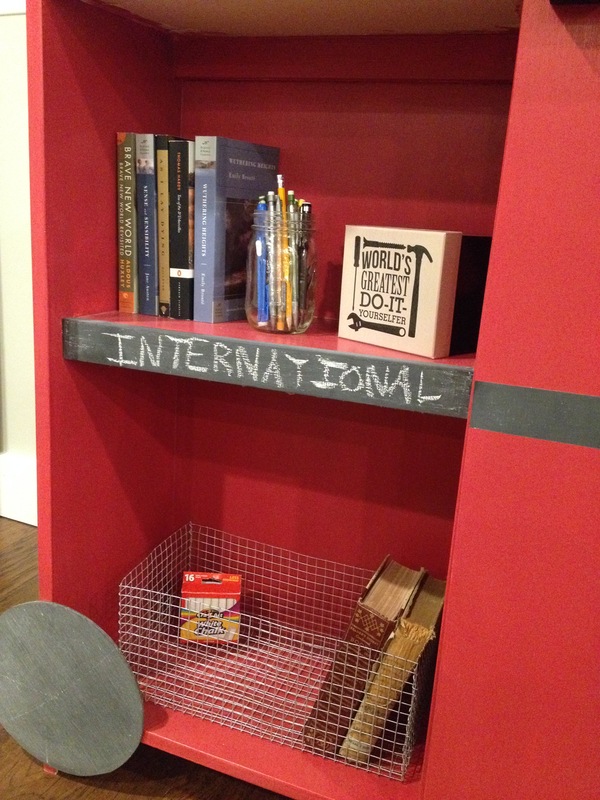 Attach these with pocket holes and screws on the underside of each shelf. Next, I cut a piece of plywood to cover the section on the right. This will be the door. And I cut two circles out of the 1/4″ plywood for the wheels. I made the back wheel about 12″ diameter and the front wheel about 6″ diameter. Do not attach these yet. Next, I primed and painted the shelf and door. Since the right section will be covered by the door, I didn’t paint the inside of it. 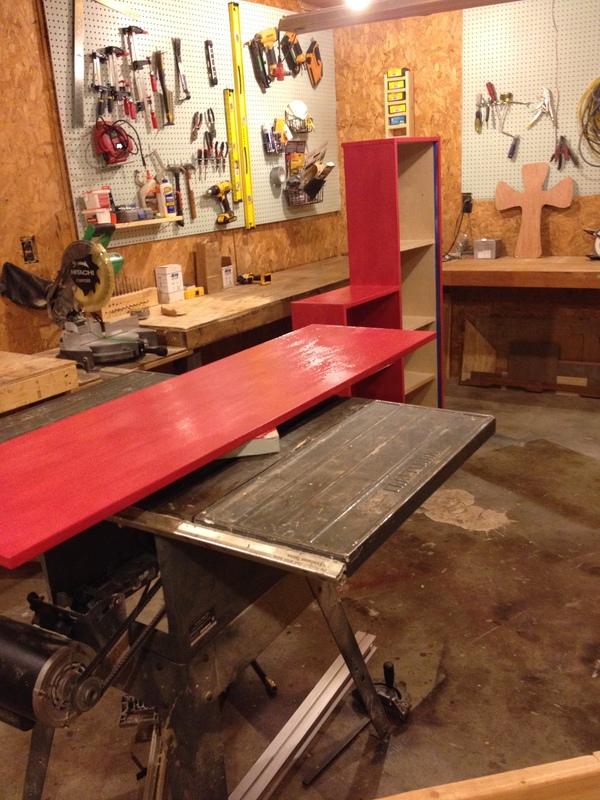 I’m telling you…red paint is the worst. I can’t figure it out. 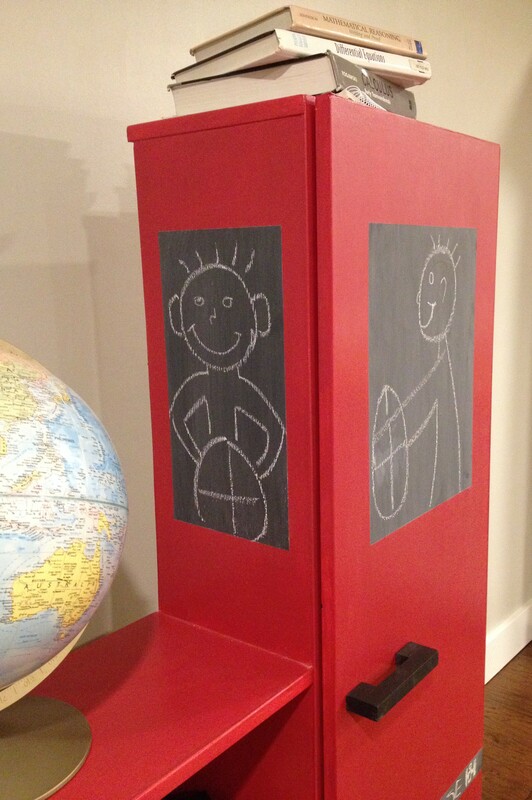 I have painted some chairs for my sister, a cabinet for my friend, and this cabinet with three different brands of red paint–one of which I’ve always had good results from–and I’ve had to put on 4-6 coats on all of them. Any other color seems to take 2-3 coats. I don’t get it. Once the paint was dry, I attached the door with hinges and cut a little handle out of a scrap 1×2 board. 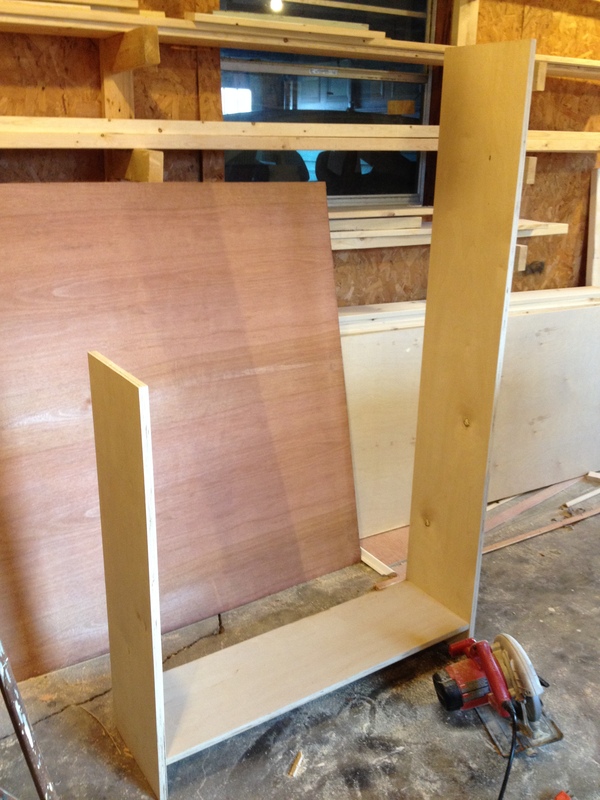 I also cut a 1×2 board to go as the face frame of the left side shelf (see pics below). 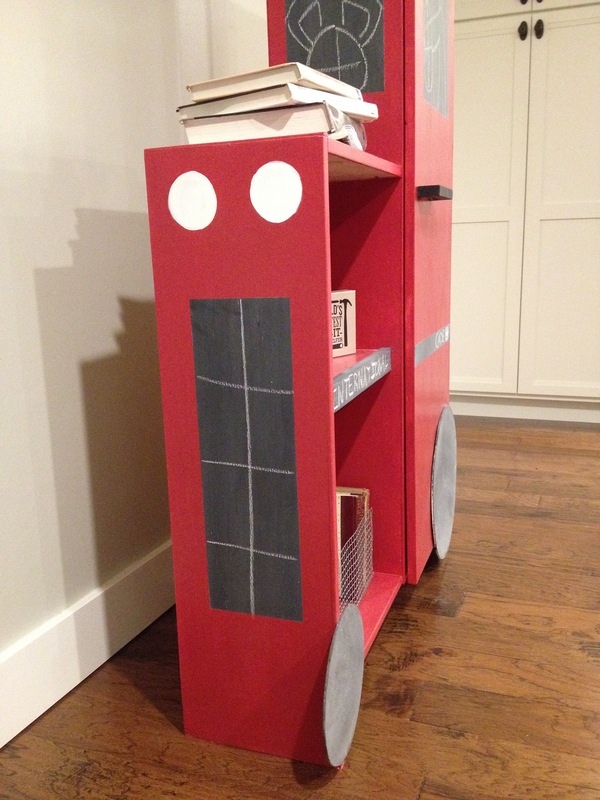 I painted the wheels, handle and that 1×2 piece with chalkboard paint. Then I taped off a rectangle in the front for the “grill” below the headlights (I have no idea what technical tractor parts are called), the front window, the side window on the door, and a line across the door level with the 1×2 that will go on the left shelf and painted them with chalkboard paint. I used a nail gun to attach the 1×2 to the shelf once the paint had dried and screwed the handle in from the back of the door. I glued and nailed the wheels on and painted circles (very carefully) for the headlights. 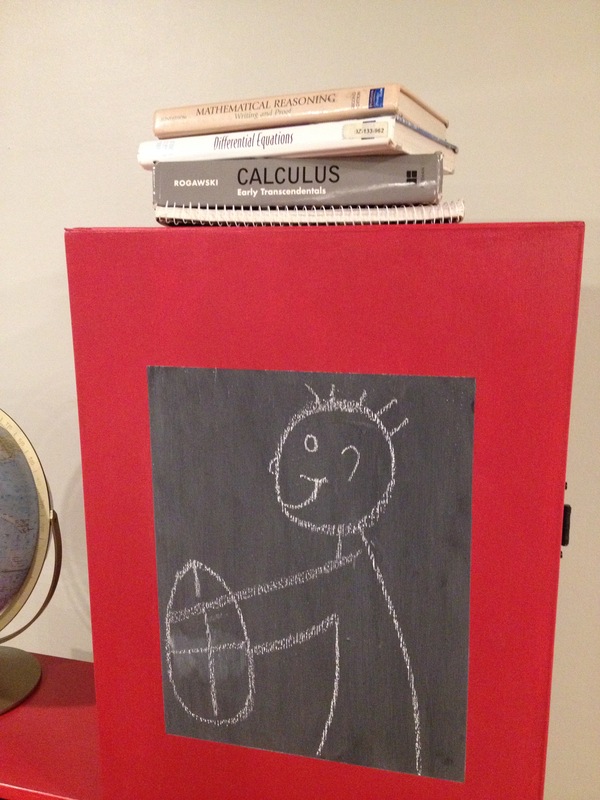 After the chalkboard paint had time to cure (check instructions as different brands require different drying times), I drew on my little guy on the windows and decorated it with random things I found in my house. I don’t have kids, so trying to find “kid things” to put on a kid shelf is difficult. Just pretend, okay? And I’m sure little boys study Mathematical Reasoning, Differential Equations, and Calculus (I, II, & III)…. And I’m sure they read Wuthering Heights, and Brave New World (seriously–one of the best fiction books ever. If you like 1984, you’ve got to read Brave New World), As I Lay Dying, and Tess of the D’Urbervilles (my all time favorite fiction book–A MUST READ). Thanks for checking it out. AND…..Keep an eye out for some big news coming Monday. I’m seriously so excited!!! I have a lot of fun things coming up…if I can just get some time to spend in the shop when the temperature is above freezing! So stay tuned!